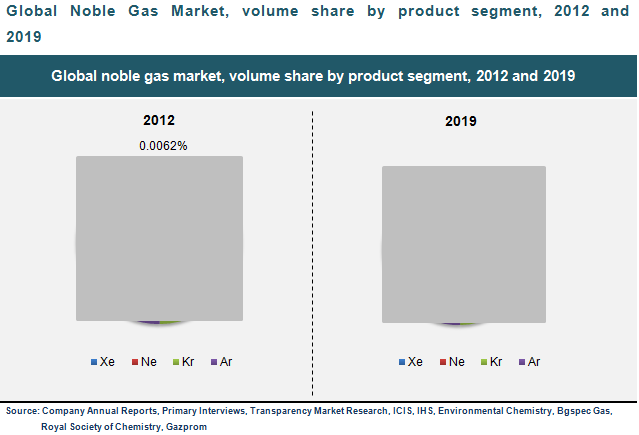 Transparency Market Research has released a new market report titled “Noble Gases (Helium, Xenon, Neon, Krypton, and Argon) Market - Global Industry Analysis, Size, Share, Growth, Trends and Forecast, 2013 – 2019.” According to the report, the global noble gases market was estimated to be 179.2 billion liters in 2012 and is expected to reach 202.2 billion liters by 2019, growing at a CAGR of 1.74% from 2013 to 2019. Rising demand for energy efficient lighting solutions, impending and enacted energy efficient building codes are thereby generating the demand for insulated windows supplemented by rising health concerns are likely to attribute the overall market growth in the coming two to four years. Price fluctuations owing to economic instability coupled with utilization of alternate gases such as nitrogen and hydrogen are some of the key challenges to the market growth. Proliferation of new technologies across the world is likely to generate new opportunities for the market. Key product segments analyzed in this study include Helium, Neon, Krypton, Xenon and Argon. Helium segment dominated the overall market, accounting to 99.21% share in 2012. Excluding helium Neon and Argon dominated the noble gases market in 2012 amidst the rare gases (Neon, Xenon, Argon and Krypton). Apparently, it is evident that the demand for krypton and Xenon is expected to rise rapidly in the coming four to five years. North America dominated the global noble gases market in 2012, accounting for 32.09% share of the market. Asia Pacific followed North America in terms of market share and is expected to dominate the overall market by 2019 owing to growing applications in the construction and healthcare industry. China and Japan held majority of market share in Asia-Pacific region. Apparently, economic meltdown in Europe and North America withered the market growth declining the demand for noble gases. Developing economies in the region are driving the market. Some of the key players of the market include Air Liquide S.A., Airgas Inc., Air Porducts and Chemicals Inc., Praxiar Inc., The Linde Group, Ellenbarrie Industrial Gases Ltd., Proton Gases and Universal Industrial Gases Inc. The report provides an overview of these companies followed by their financial revenue, business strategies, and recent developments. The research analyzes and estimates the performance and market of noble gases in the global scenario, providing detailed trend analysis of the market by geography and comprehensive analysis of companies that are dealing in noble gases manufacturing. Transparency Market Research (TMR) is a global market intelligence company providing business information reports and services. The company’s exclusive blend of quantitative forecasting and trend analysis provides forward-looking insight for thousands of decision makers. TMR has experienced team of analysts, researchers, and consultants use proprietary data sources and various tools and techniques to gather and analyze information.